The Six of Swords represents the time when we must move on from what we’ve known. Sometimes there is no salvaging the past, there is just burying it and leaving it behind. It is almost always a time of sorrow, even when the future holds hope. This tarot card represents the need for that journey at this point in the Minor Arcana. The time has come, and even tinged with sorrow as it may be, you know that it’s long past due. There is relief in it, leaving behind the baggage of the past, and this is a step that is very difficult for many people to take. The journey may be metaphorical, or it may in fact be a literal physical journey, or any combination thereof. You’ve recently made a huge step, a necessary part of an unfortunately painful journey. Congratulations on having moved past the pain and grief of your past, and clearing yourself for the bright future that you deserve! It’s time to continue your journey my dear. You have carried the pain of the past, and now it’s time to set down the burden of your past and move forward. Doing so will offer you relief. 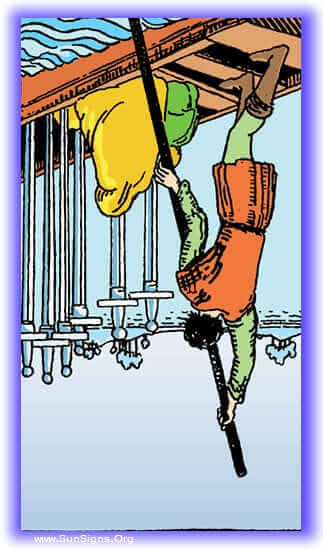 This tarot card being in its present position indicates that you can let go, it’s time to let go. The Six of Swords in this position represents hope, the hope that if you let go of your current circumstances, let go of the pain of your past, that the future holds great things for you. All it takes is releasing the past that is weighting you down, and the future is here waiting for you. Sometimes we recognize it’s time to move on, but the past keeps showing up like a bad penny. We keep struggling to leave the baggage behind, to cut it loose. But we either can’t quite bring ourselves to let go, or it keeps following us. 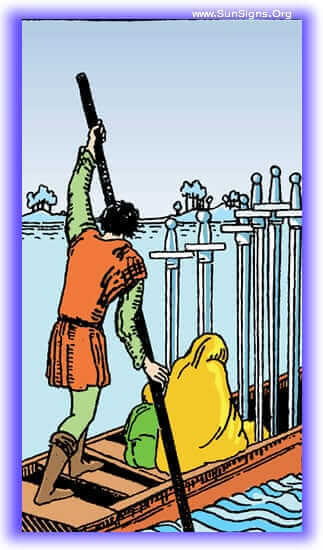 The Six of Swords in inverted positions also shows up when the change isn’t your choice, it still indicates it’s a needed change, but it is made more difficult when it’s not something you chose. You’ve been struggling to drop your baggage, and it’s been affecting your relationships. With this card in your past it indicates that you’ve been struggling not with being ready to let go, but with being successful in this. Counseling may help if it’s an emotional issue. You’ve been seeking an answer to your troubles, and the answer is as simple and difficult as this. Let go. This is no mystery to you, you know this is the difficulty you’ve been facing, but this is what it comes down to. Let go, and move on, and you will set yourself free. Someone in your future does not desire you to be free, you’ve been doing so well in letting go of your past, but it’s about to come back to haunt you. Do not let it remain when it shows up. Dedication to your own healing and recovery can excise this wound from your past, and prevent it from coming back to your future.